In recent times, the news and images from Syria are mostly about destruction, devastation and displacement. But Syria: Into the Light, an exhibition presented by the Atassi Foundation in collaboration with Alserkal Avenue, offers a different narrative by showcasing the country’s rich artistic heritage through the works of modern and contemporary Syrian artists. The history of the Foundation goes back to 1986, when sisters Mouna and Mayla Atassi opened the Atassi Gallery in Homs, in the attic of their bookstore. The gallery, which was the city’s first private art gallery, hosted exhibitions of some of Syria’s most prominent artists such as Fateh Moudarres and Abdullah Mourad, and became the hub of the local art scene in Homs. In 1993, the Atassis moved the gallery to Damascus and expanded its activities to include publishing and collaborations with regional and international galleries and institutions. Although Mayla Atassi moved to Dubai where she opened Green Art Gallery in 1995, the Atassi Gallery in Damascus continued to grow, becoming a vibrant meeting place for artists, writers, filmmakers and other intellectuals. 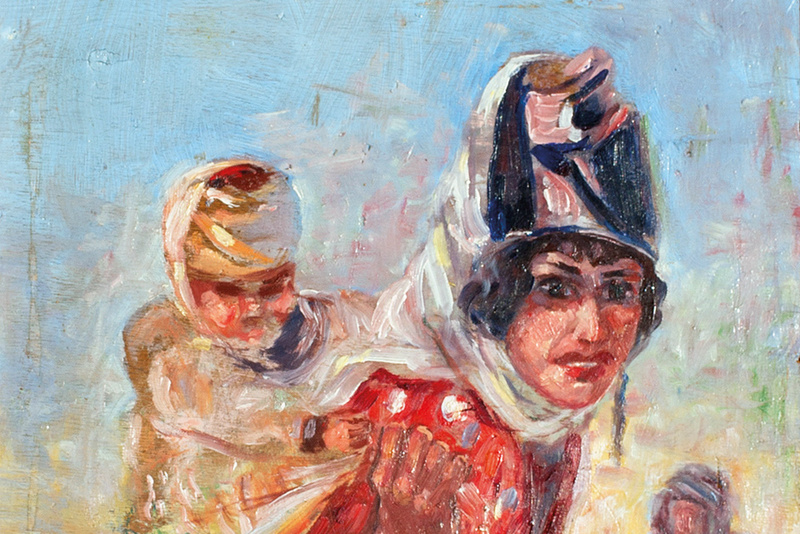 When the conflict began in Syria, the Atassis shifted their focus on preserving, protecting and documenting their extensive collection of Syrian art by establishing the Atassi Foundation, with the firm belief that art plays a vital role in healing the pain of war and preserving a country’s history and culture for future generations. The Foundation’s collection is one of the most comprehensive collections of Syrian art, spanning from early 20th century works by modern masters to present day contemporary works in various media. Syria: Into the Light is the Foundation’s first exhibition in the region, and its largest ever, with over 60 works by more than 40 artists on display. The show is curated by Mouna Atassi, and writer and curator Rasha Salti. The curators have chosen the theme of ‘portraits and figures’, to illustrate the landscape of Syrian art, and highlight the trajectories and shifts of art movements in Syria, and its socio-cultural histories, from the early 20th century to the present. The show features artworks by Syrian masters as well as emerging talents. They range from paintings, drawings, etchings and sculptures to photography, installations and video art, many being exhibited for the first time in the region. “This exhibition considers the past, and looks at the future through works created by Syrian artists. It invites visitors to embark on a journey into Syria from the dawn of the 20th century to the present. We chose the theme of portraits and figures because portraiture is a prominent feature of modern and contemporary art in Syria. It embodies human experiences, refracts social realities, and represents individuals and societies as carriers and preservers of collective memories. The faces, eyes, gestures and postures depicted in the artworks represent a world of imagination and reality combined, portraying the life of a country. Given Syria’s present reality this show is an invitation to rediscover the creative soul of the country, and a compelling story of a people, narrated through the imagery of four generations of artists,” Mouna Atassi says. Two icon paintings from the 18th and 19th centuries, placed next to the entrance, remind visitors that the Aleppo school of icon art is one of the three main icon schools in the world. A historic painting on glass, created by one of the first folk artists in Syria hangs beside the icons, highlighting the fact that human beings have always used imagery to express themselves. 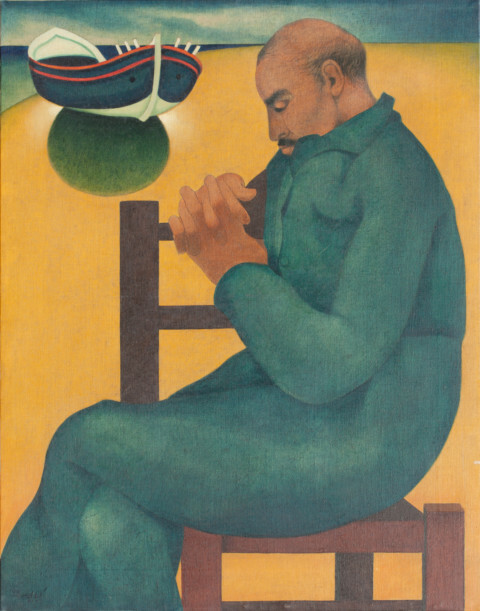 The show’s narrative begins with a series of portraits from the early 20th century, when Syria was still a part of the Ottoman Empire, by modernists such as Nazem Al Jaafari, Michael Kurcheh and Tawfik Tarek, who was the first Syrian artist to study art in France. These are formal portraits of the artists’ family members, and subjects such as sufi dancers, with silent backgrounds, done in a classical European style. A change to a more impressionistic and emotional style is seen in the next section featuring paintings and sculptures from the mid-20th century, when Syria first became a French mandated territory, and then a Republic in 1945. During this period pan-Arabism and a search for identity were important issues. 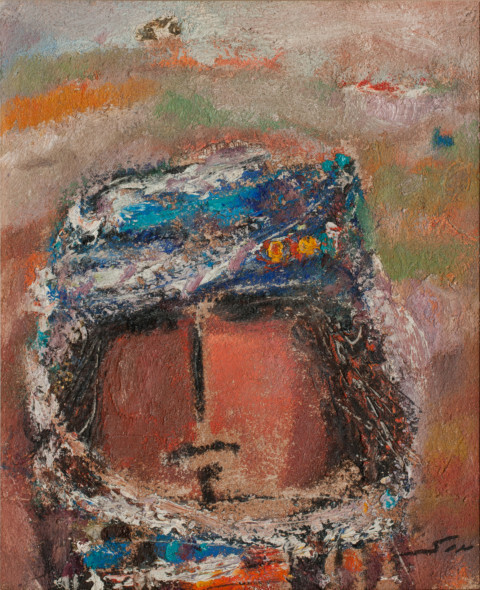 The artists expressed these by focusing on mythology, and the proletariat, such as Louay Kayyali’s paintings of fishermen and cotton pickers, the abstract figures of Fateh Moudarres and Marwan Kassab Bachi, and mythological figures painted by Elias Zayyat. Most of the artists featured in this section studied art in Europe, and returned to teach at the College of Fine Arts that opened in Damascus in 1960. Their influence can be seen on their students, whose works appear in the next section. However, this generation of artists was more concerned about domestic issues rather than Arab nationalism and identity. This is seen in photographic works about Kurds, the Druze, and Bedouins, drawings depicting social environments, and politically charged works by activist artists such as Youssef Abdelki. During this period women artists were integrated into the art world, bringing their own perspectives to the discourse. The show gives centerstage to younger and emerging artists, underlining the primary focus of the Foundation itself. Most of these artists have been displaced due to the conflict in Syria, and their work expresses their feelings about the situation as well as their determination to continue creating art and experimenting with new media, techniques and ideas despite the challenges. The artworks in this section, displayed in the front of the gallery space, include videos, installations, graphic art, street art, and sculptures. Pieces such as Hiba Ansari’s fabric works featuring Daesh masks from Raqqa decorated with beads, Nour Asaria’s sculptures depicting Virgina Woolfe’s suicide by drowning, and Dino Ahmad Ali’s optical art ‘Compression’ speak about the struggles, pressures and injustices of our times, capturing the zeitgeist. 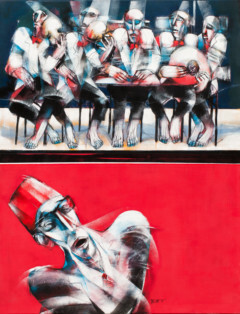 In sharp contrast is Ahmad Mualla’s optimistic, monumental painting, ‘Power and the People’ from 2011. This exhibition is the inaugural event at Concrete, the new multi-disciplinary, multi-purpose event venue at Alserkal Avenue, and the show has been designed by well-known Syrian architect, Michel Zayat, to accentuate the features of the space. Concrete has been designed by the Office for Metropolitan Architecture (OMA), founded by Rem Koolhaas. Covering 600 sq m, the space has multiple distinct configurations, allowing it to host up to four separate events at the same time, and offering event organisers great flexibility in visualising creative fashion, film and corporate events, conferences, and private functions. 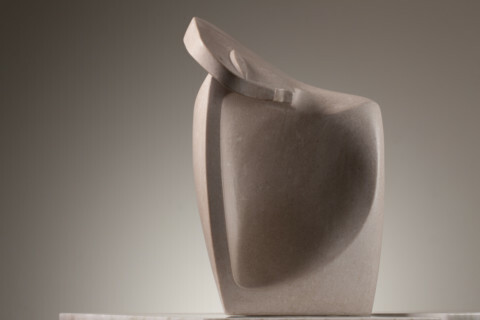 Syria: Into the Light will run at Concrete, Alserkal Avenue, until April 3.